Disappointing race yesterday in Sheboygan. A steady persistent rain made for slick streets so I opted for the inside line on all four corners. This was a good decision because there were more than twenty wrecks. Many of them were single rider wrecks of someone taking a corner a bit too fast and sliding out. Sometimes the wrecks took down more than one person though. There was a wreck on the first turn of the first lap of the race. Then there was a wreck on the last turn of the first lap of the race. In fact, for the first ten laps, there was a wreck on that last turn about every lap. The only corner that didn’t have any wrecks was turn three. Eventually, though, after the first ten laps enough people had dropped out of the race and our pace had settled down enough that we went relatively wreck free for the middle 30 laps or so. Then in the last few laps, the wrecks ratcheted up again with wrecks on Turn #1 and Turn #4. The last lap had a wreck on Turn #1 which I squeezed around losing enough momentum not to be able to pass anyone from there to the finish. I was pretty much the last rider relatively cleanly around the wreck, though, so nobody passed me either. So I finished at the back of the front group for 26th with Dan Holloway (Kelly Benefits) taking the win. I had great tires that never slipped once, even when going for a $100 prime. That was the most disappointing part of the race for me. I attacked going into the third corner for the prime. I got away from the field and went as fast as I could around the third and fourth corners. I had a pretty good gap, but I knew that I needed to sprint like it was the end of the race in order to stay away for the prime. Out of turn #4 was a painfully long 500-600 meter sprint. I went as hard as I could and got passed by 1 guy about 10 meters before the line. I was so frustrated and crushed because we really needed the $100 given that we found out earlier in the day that our car needed a $600 repair (the electronics in the car are shot, no instruments, $450 part + $150 labor) to make it safely home to Alabama. Still, I fought hard and yet somehow managed to slide back far enough to be out of the money at the end, too. So in other words, I raced a long, hard dangerous race (because of the wet conditions) and got absolutely nothing for it. No money, no points. I got passed by the eventual winner (US pro crit champion Dan Holloway) with two laps to go. How am I in the same position as the winner with 2 laps to go, and yet he wins the race while I somehow slide back to 26th?? I guess it is all about risk taking. It was a flat race, too, and I warmed up on rollers so I only managed 1000 ft of climbing for the Strava Studio Velo competition. The only bright spot on the day is that my family joined me for the race and is here with me for the last three races. The kids didn’t care that it was 60 degrees and raining and a had a great time playing in the rain on a playground while Kristine and I huddled under a small shelter. Then they rode their scooters in the rain and cheered with Kristine during the entire race. I guess it was good that I was “off the front” going for the prime to help make the race exciting for them – even though I didn’t get the prime, which really sucked (did I mention that already???) After the race, the kids wanted to ride a lap of the course with me, but the streets were already open so we settled for a ride down through the start/finish area and back. Kudos to the race organizers, officials, and SRAM mechanics for keeping the race running on time and well organized despite the wet weather. I opted to ride without my iBike given the increased probablity of an iBike breaking wreck. Also, thanks to one of my sponsors back home (Dan Taylor – Infinity Medispa) for the suggestion to ride with my garmin in a ziplock bag in my back pocket. Worked perfectly and I didn’t have to fool with finding a rubber band to cover up the Garmin with a ziplock bag while mounted on the bike to keep it from malfunctioning in the rain. 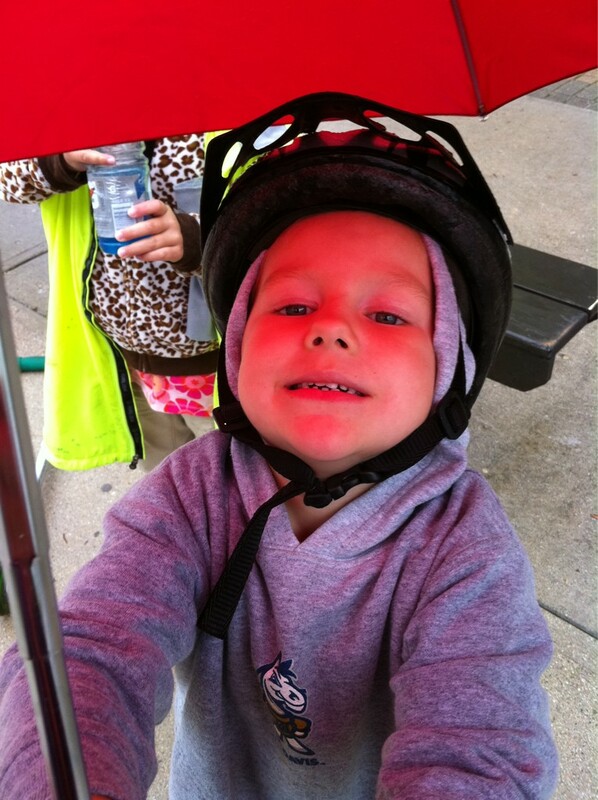 This entry was posted in Racing and tagged criterium, race, rain, toad, video, wisconsin on June 24, 2011 by kartoone.